We're always looking for contributors for the ACKC newsletter. If you have an article or trip report, please let our newsletter editor know. To read our newsletters you must have Adobe Acrobat reader installed on your computer. You can download Acrobat here. Gwen Beatty welcomed everyone to the meeting and introduced the speaker for the evening, David Still, Executive Director of the Suwannee River Water Management District. Some of the key points in his presentation are as follows: Water supply is critical for North Florida's future economy. Ground water is not sustainable. He discussed and showed a map of all of the springs in his district, and said that during low water levels most of the water in the Suwannee River is spring water. 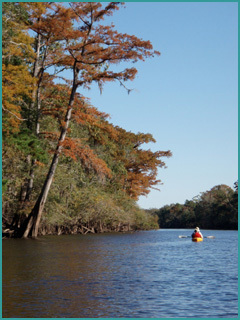 Another fact about the Suwannee River is that 57% of the Suwannee River basin is in Georgia, and that river has the second largest annual discharge in Florida. Everybody is part of the problem and must be part of the solution. The SRWMD has created Water Supply Management Areas and implemented a water shortage advisory. Phase 1 requires people only water lawns and landscapes two days a week. a. should be reasonable beneficial, b. in the public interest, c.no impact to existing legal users. There is a scientific study required by state statue to establish Minimum Flow Levels. They are expensive to accomplish, and Still estimated it would take a year to do a Wacissa MFL study. It includes (probably not limited to this list) studying discharge, biology, invertebrates, manatees, endangered species. No volunteers can be used because data needs to stand up in court. When questioned about the current status of the Nestle's Application Still stated none exists because Nestles has not submitted an application for bottling water. All they have done at the present time is drill 4 test wells on private property and Nestle obtained permits from the SRWMA for 4 inch wells. Process: Submit an application, then Water Management district has 21 days to evaluate and if necessary request additional information. The applicant has 60 days to respond. If not answered adequately, the WMA can request more information, and again the applicant has 60 days to respond. The only thing the WMA cannot do is ask for new information, they must restrict their request to already established issues. The WMA uses ground water level models as a predictive tool, they are an accurate way to predict outcomes. Gwen Beatty recognized Georgia Ackerman from Wilderness Way. Akerman has been instrumental in organizing and participating in the efforts to save the Wacissa River from the use of the spring water for bottling by the Nestle company. Don Kelly gave a report on the North West Florida Water Management District aquisition of 1,400 acres along the Chipola. He represented the ACKC in a user interest group meeting led by John Valenta. Each user interest group, i.e. hunters, fishermen, paddlers, etc was asked to submit three points for consideration. His group selected a. sanitation, b. safety (especially at Look and Tremble rapids) c. parking. Kelly predicts it will take some time for the development because of recent budget cuts. On July 16 the Florida Trail Association is offering Basic First Aid and CPR course, and on July 23, 24 they are offering Wilderness First Aid Course. Those participating must be a member of the Florida Trail Association, and the Basic Course is a prerequisite for the Wilderness course. Contact Gwen Beatty for additional details. Gwen Beatty reported on the preliminary planning that had been accomplished in consideration of the ACKC sponsoring the Florida Paddlers' Rendezvous in 2012. It is proposed that the Rendezvous be based in Marianna at Arrowhead Campground because Florida Caverns and Three Rivers State Parks are too small. Tentative fees are $29 for tent camping, and $33 for RV camping, but the club may be able to work out a discount for the event. The Pavilion is free. The club voted to sponsor the event, and the information provided to Erica Johnson of the Florida Sports Paddlers, who has coordinated this event in the past few years. Trip Report about the Middle Econfina Paddle: Dan Dobbins led the trip, and there were a total of 5 paddlers. The aggressive dogs did show up, there was one major pull-over, and some other smaller stuff to avoid. Trip Report: Backwater River State Park camp-out with paddles on the Big Escambia Creek, Yellow River, and Shoal River, with some participants doing other private paddles. Two new trip reports on the website, Tom and Carol Butler's paddle in the Cedar Key area, and a report on a Boiling Creek paddle posted by Frances Stone. Clean-Up on the Upper Ocklocknee: Andrew Maloney is leading this event. Contact him at 850-728-0271 or at www.ochlocknee.com The area to be covered is from SR 12 to US 90, and will be a long paddle taking all day. You are in the public comment zone. What follows is not from Florida Sea Kayaking Association; it comes from other people and we don't vouch for it.